This is a VB based project on "Cable Operator Management System" and is used to eliminate manual process of managing cable subscriptions. The objectives of the system are to make the cable accounting automated and simpler then it is done manually. 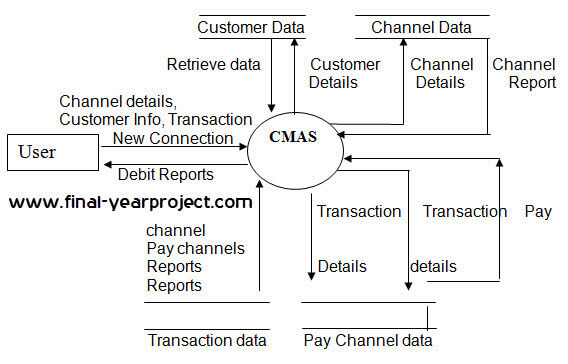 The connections accounts and transactions are entered on computers and saved on computers and can be accessed as in the form of the reports and can be updated very easily on computers. You can also Subscribe to FINAL YEAR PROJECT'S by Email for more such projects and seminar. In this system there are many accounts in the number of hundreds to thousands. So, It is quite difficult to manage their accounts and transactions in account books. Also new trend of Pay channels came, so the management of this Pay Channels also can be done in this automated cable system. The existing system being manual is a slow and moreover its very difficult to access the reports of connections and transactions. Thus for accurate and fast retrieval of reports the system was to be automated. ✓ The users of the system are only the partners of the Organization. ✓ More enhancements can be made to this system for advertising in the bottom of the TV screen of the cable broadcasting. The PowerPoint slides can be added to VB forms and the selected slides can be presented in the bottom of the screen. ✓ Other enhancement to prepare a module for telephone requests for songs and movie clips. Record of the telephone no. And time of requests is saved and that user can’t request again within next half hour. Also time limit for selections from the made menu can be set. This is a Visual basic 6.0 based project and has M.S. Access 98 as back end tool and can be used for reference and study, though it is little bit outdated. Downloaded file includes project report, presentation, data flow diagram, VB coding and complete software of Cable operator management system, etc.